Zina Asfour and Adrien Frasse-Sombet play Boghos Gelalian and Dia Succari. 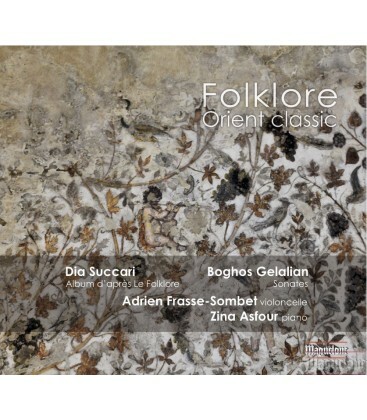 Rarely recorded, this album includes two sonatas by Boghos Gelalian, whose music is largely inspired by the Armenian and Arabic folklore, andve pieces entitled “Album d’Après le Folklore” byDia Succari which are ve tunes from the orientalpopular music arranged in the occidental style. 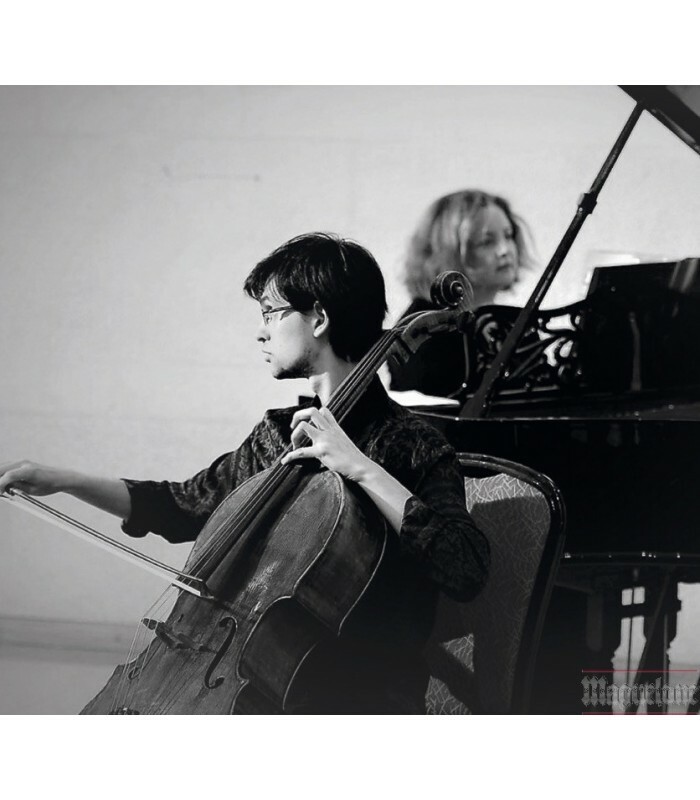 are two musicians from two different worlds (France and Jordan) who both share the interest in discovering new music by contemporary classical music composers. This album “Folklore” is music for cello and piano by two prominent composers from the Middle East: Boghos Gelalian and Dia Succari. Both composers lived in the same period (20th century) and were exposed and inspired by their oriental roots and musical folklore in the East Armenia, Lebanon and Syria. They have merged through their music and their own history with the occidental school and expression, forming a new universal music. 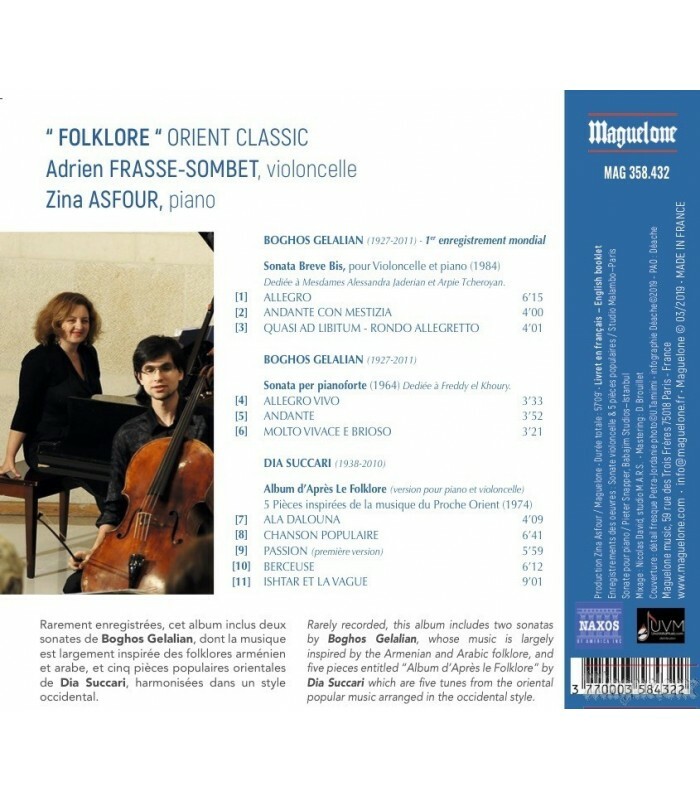 The album includes two sonatas by Boghos Gelalian, whose music is largely inspired by theArmenian and Arabic folklore, and ve piecesentitled “Album d’Après le Folklore” by Dia Succari which are ve tunes from the orientalpopular music arranged in the occidental style. The music has rarely been recorded and the sonata for cello and piano by Boghos Gelalian isrecorded here for the rst time. We hope to bringlife to music by two wonderful composers from the East who tried to keep their oriental heritage the pulse of their works.